Lawn Doctor, in conjunction with Project EverGreen, helps with the final installment of landscaping service at Liberty Island National 9/11 Memorial Grove. Since January 2013, we've [Project EverGreen] worked with a network of partners to rally support around the restoration of the Liberty Island National 9/11 Memorial Grove. 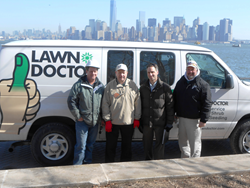 Lawn Doctor, the nation’s largest lawn care franchise, is nearing the final stage of landscape restoration at the National 9/11 Memorial Grove on Liberty Island, also home to the Statue of Liberty. On October 9, Lawn Doctor will fertilize and power-seed the area with tall fescue grass seed, completing the final installment with Project EverGreen to repair damage caused by Hurricane Sandy. Upon consultant evaluation, it was concluded that the soil was densely saturated with salt and would not be conducive to flourishing grass regrowth. The soil damage not only killed the vegetation on the island, but it also posed a threat to the people and property on Liberty Island. Along with a few green industry volunteers, Lawn Doctor aerated the soil with gypsum to leech out the salt from the root zones in remedy of the high soil salinity. Project EverGreen, in partnership with the federal government and the National Park Service, commenced the initiative to renovate the national grove in 2014. The renovation was launched with a $50,000 in-kind and donation investment made by several local landscaping companies including Lawn Doctor, Bartlett Tree Experts and Lidochem Inc. In addition to the fertilizing and power-seeding services to be performed on October 9, Lawn Doctor also provided aeration and application equipment as well as on-site participation in March 2014 and June 2014 restoration installments, all as a donation to this nationally beloved landmark. Lawn Doctor, the largest lawn care franchise in the country, is comprised of locally owned and operated businesses supported by a national brand. The Lawn Doctor family of approximately 500 franchises in more than 40 state uses proprietary technology and equipment, designed and built in Lawn Doctor’s NJ manufacturing facility. The licensed services provided by Lawn Doctor help maintain and improve your property’s overall condition and appearance, as well as protect your health and comfort with mosquito and tick control. Backed by a 100% guarantee, Lawn Doctor instills confidence that your yard is in good hands. For more information on Lawn Doctor, visit http://www.lawndoctor.com and http://www.lawndoctorfranchise.com. Headquartered in Cleveland, OH, Project EverGreen is a national non-profit 501c3 organization committed to preserving and enhancing green spaces in our communities where we live, work and play. To date, Project EverGreen has completed projects in cities around the country including on Liberty Island (New York City), Washington D.C. (on the National Mall), San Antonio, Toronto, Ft. Myers, Akron, Ohio, and Greensboro, Cary, Raleigh and Highpoint, N.C. Each year, Project EverGreen explores a variety of projects and new efforts are in the planning stages.